Tambora eruption caused the year without a summer: Cholera, opium, famine, and Arctic exploration. After the tsunami and famine came cholera, opium, and failed Arctic expeditions. Aerial view of Tambora, which, 199 years ago today, was the site of one of the most devastating volcanic eruptions on Earth. 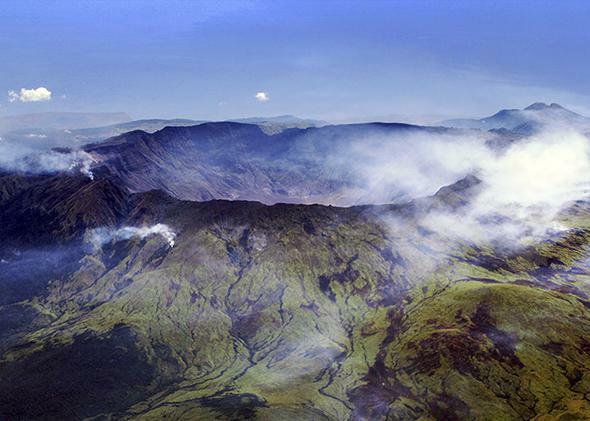 Most have heard of the Battle of Waterloo, but who has heard of the volcano called Tambora? No school textbook I’ve seen mentions that only two months before Napoleon’s final defeat in 1815, the faraway Indonesian island of Sumbawa was the site of the most devastating volcanic eruption on Earth in thousands of years. The death toll was around 100,000 people from the thick pyroclastic flows of lava; the tsunami that struck nearby coasts; and the thick ash that blanketed Southeast Asia’s farmlands, destroyed crops, and plunged it into darkness for a week. Both events—Napoleon’s defeat and the eruption—had monumental impacts on human history. But while a library of scholarship has been devoted to Napoleon’s undoing at Waterloo, the scattered writings on Tambora would scarcely fill your in-tray. This extraordinary geological event took place 199 years ago today, and, on the cusp of its bicentenary, Tambora is finally getting its due. With the help of modern scientific instruments and old-fashioned archival detective work, the Tambora April 9, 1815 eruption can be conclusively placed among the greatest environmental disasters ever to befall mankind. The floods, droughts, starvation, and disease in the three years following the eruption stem from the volcano’s effects on weather systems, so Tambora stands today as a harrowing case study of what the human costs and global reach might be from runaway climate change. Tambora’s greatest claim to infamy lies not in the direct impact it had on what was then the Dutch East Indies (which was terrible enough), but its indirect effects on the disease ecology of the Bay of Bengal. The enormous cloud of sulfate gases Tambora ejected into the atmosphere slowed the development of the Indian monsoon, the world’s largest weather system, for the following two years. Drought brought on by the eruption devastated crop yields across the Indian subcontinent, but more disastrously gave rise to a new and deadly strain of cholera. Cholera had always been endemic to Bengal, but the bizarre weather of 1816–17 triggered by Tambora’s eruption—first drought, then late, unseasonal flooding—altered the microbial ecology of the Bay of Bengal. The cholera bacterium, which has an unusually adaptive genetic structure highly sensitive to changes in its aquatic environment, mutated into a new strain. This was met with no resistance among the local population, and it spread across Asia and eventually the globe. By century’s end, the death toll from Bengal cholera stood in the tens of millions. Just as the biological disaster known as the Black Death defined the 14th century in Europe and the Near East, so cholera shaped the 19th century like no other calamity. Much of our medical science, and our modern public health institutions, originate in the Victorian-era battle against cholera. But only now, thanks to renewed scientific interest in the relation between cholera and climate change, can we make the connection between the worldwide cholera epidemic originating in 1817 and Tambora’s eruption thousands of miles away. Tambora’s ripple effects were felt across the globe. In southwest China, the outlying mountainous province of Yunnan suffered terribly from the cold volcanic weather, losing crop after crop of rice to bitter winds and flooding rains. The situation was so extreme that desperate Yunnanese resorted to eating white clay, while parents sold their children in the town markets or killed them out of mercy. In the aftermath of this three-year famine, Yunnan farmers turned to a more reliable cash crop—opium—to ensure their families’ survival against future disasters. Within a few decades, opium was being grown all across Yunnan, while opium-processing technology and expertise drifted south into the remote mountains of modern-day Burma and Laos. The “golden triangle” of international opium production was born. If the Tambora disaster persists in cultural memory at all, it is as the “Year Without a Summer,” 1816, the most notorious and best chronicled extreme weather event of that century. Snowstorms swept the East Coast of the United States in June, ensuring the shortest growing season on record. Crowds of desperate and hungry rural folk from Maine and Vermont fled snowfalls of up to 18 inches to the western frontier, which had been spared the worst of Tambora’s weather. Here grain harvests were fetching sky-high prices on the famine-struck Atlantic market, but after the boom came a shattering bust—the so-called Panic of 1819—which triggered the first sustained economic depression in U.S. history. East Coast speculators had invested hugely in western agriculture post-1816, only to lose their shirts when the similarly-affected European grain markets returned to normal in 1819 and commodity prices plummeted. “Never were such hard times,” wrote Thomas Jefferson of ordinary Americans who, across the country, found themselves “in a condition of unparalleled distress,” persisting well into the 1820s. As it turns out, however, the indirect ripple effects of Tambora—what climate scientists call “teleconnections”—were even more historically significant. Cholera, opium, and the Panic of 1819 are three examples; another is Arctic exploration. One of the paradoxical effects of a major tropical eruption is that while the planet in general is cooled by the blanket of volcanic dust that drifts from the equator to the poles, the Arctic itself is drastically warmed owing to changes in wind circulation and north Atlantic ocean currents. This anomaly was discovered only after the 1991 eruption of Mount Pinatubo in the tropical Philippines, the first observed with the benefit of modern climatological instruments. In 1817 and 1818, the British Admiralty began to receive exciting reports from whaling captains of a remarkable loss of sea ice around Greenland. Huge icebergs from a broken icepack were spotted floating as far south as Ireland and New York. The prospect of a northwest passage for shipping to the East—a holy grail England had sought since Elizabethan times—beckoned once more. With a generation’s naval captains still hungry for glory but now languishing onshore after the defeat of Napoleon, the Admiralty launched an expensive and ultimately disastrous 50-year-long campaign to chart the elusive northwest passage. It is time to recognize Tambora as the Napoleon of eruptions. The implications—for historians—of a revised, volcanic 19th century are immense. As with the global cholera epidemic, and the growth of a Chinese opium empire, Victorian-era polar exploration might not have happened at all, or would have evolved in an entirely different direction, had it not been for Tambora’s climate-wrecking detonation in 1815.